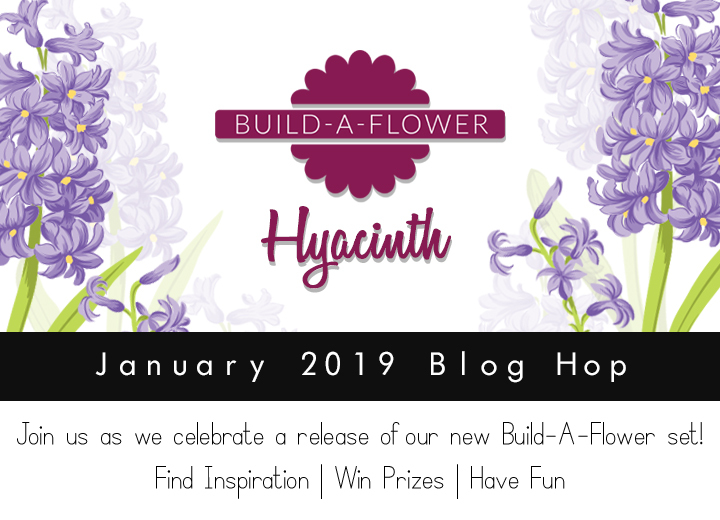 Build-A-Flower: Hyacinth Release Blog Hop + Giveaway! Hello everyone and welcome to our special Build-A-Flower Release Blog Hop! If you just came from the amazing Keeway Tsao‘s blog, then you are right on track. Feel free to start the blog hop on the Altenew Card Blog. This month, we are introducing the gorgeous Build-A-Flower: Hyacinth! The Hyacinth flower is a lovely cool weather plant native to the eastern Mediterranean region. These highly fragrant, bell-shaped flowers come in many colors. They bloom in the palest pink to the deepest magenta. There are also some beautiful blues including a soft baby blue and a striking, deep indigo blue. Symbolizing sport or play in the language of flowers, hyacinths represent constancy, while the blue hyacinth expresses sincerity. In this set, we have included two hyacinth flower bunches. Each cluster of flowers has a solid layer and two detail layers, while the stems and leaves have two layers. The larger flower bunch has an additional flower-center layer. 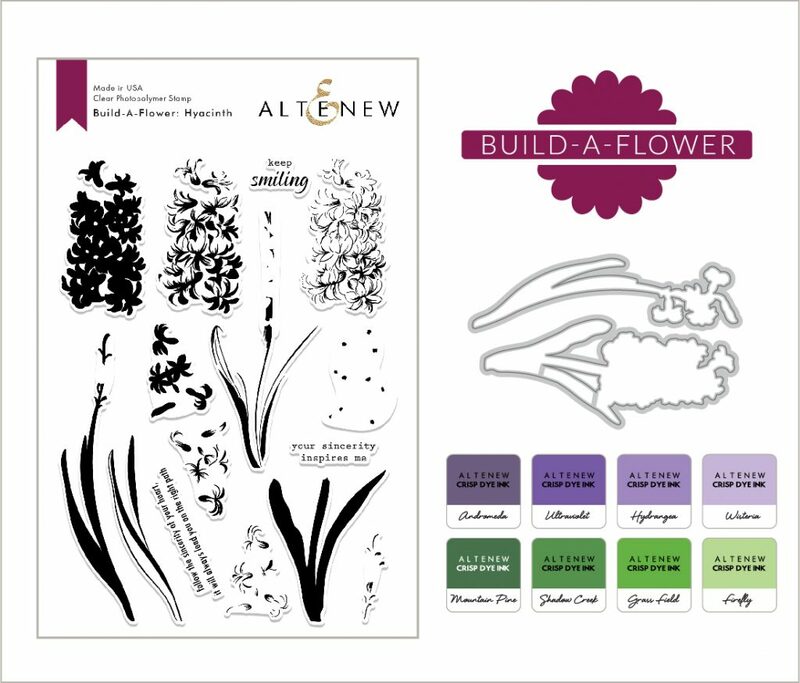 We also have a very special Build-A-Flower: Hyacinth and Ink Bundle to make it easier for you to start creating beautiful projects. Get the bundle and save 5%! To celebrate this special release, we are giving away a $30 gift certificate to SIX lucky winners! Please leave a comment here on the Altenew Scrapbook Blog and/or on the Altenew Card Blog for a chance to win. Six winners will be announced, three on the Card Blog and three on the Scrapbook Blog, on January 9th. We are celebrating this release with a fun blog hop! 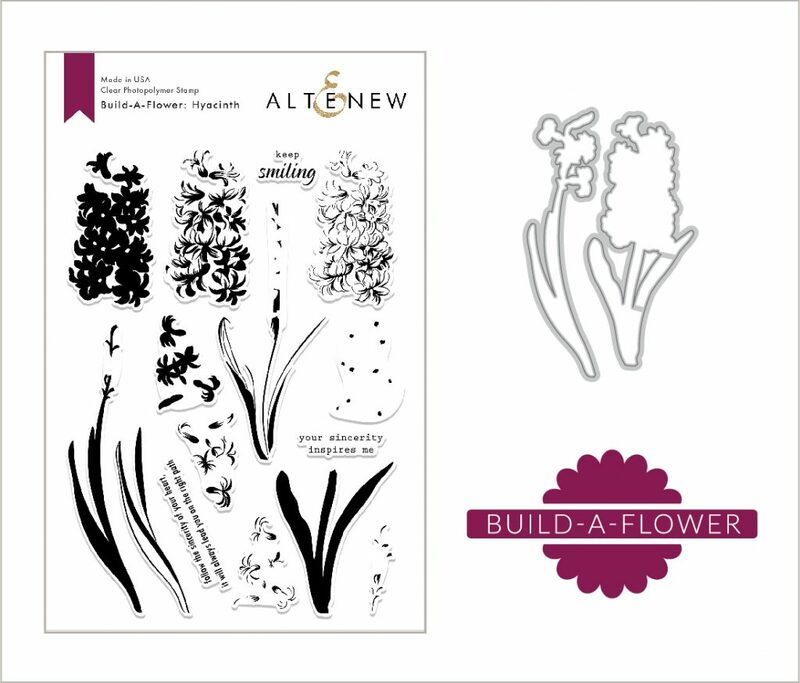 Some of our talented design team members and special guest designers have created stunning projects to spark your creativity using the new Build-A-Flower: Hyacinth. We hope you love what they have come up with! Your next stop is the incredibly talented Virginia Lu! This is such a gorgeous new floral set and so many beautiful projects being shared with it! Flowers!! I love it yea!!! Lovely stamp set, can’t wait to use! Thanks for sharing! Truly love the new flower set, the inks, and the dies. So much can be done with these products to make realistic looking cards or layouts. I look forward to seeing next month’s flower set! Love these products and the versatility. So beautiful. absolutely love hyacinths and this stamp is perfect! All the samples of this lovely set that I have been seeing on Instagram have just bowled me over and it has soared to the top of my wishlist!!! This is an amazing set. I love it so much! This is the most realistic set I’ve seen and I love hyacinths. This set is at the top of my wish list. This stamp is very pretty, loved hoping along and got lots of inspirations. Very nice set. Thank you for showing us this. This is a beautiful release, I have really enjoyed the inspiration form the “hops” so far. Can’t wait to see the rest of them. I really love this BAF set! So intricate and realistic looking! I can’t wait to add it to my collection! I love the smell of Hyacinths & I love the look of them. They are just such a pretty flower! You make the best flower stamps & I would love to win this set to get creative with. Thank you for giving us the chance to win this set. When I win this set, I will make you proud with whatever I make. Lovely stamp set and beautiful inspiration from the DT! Love this new hyacinth set. Reminds me that Spring is just around the corner. This is just lovely – as always!